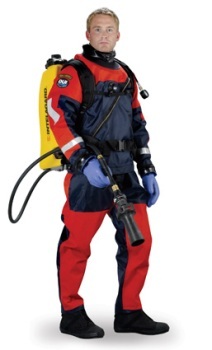 DUI designs drysuits for all types of public safety diving operations including search and rescue/recovery, vehicle and evidence recovery, swift water and ice rescue, security surveys and inspections. Colors: Navy or black body with your choice of overlay materials and colors. For the TLS Public Safety, select any of the overlay colors from Column A of the DUI Standard & Select™ Drysuit System Order Form. This is the only overlay design that does not include a Zipper Guard to facilitate easier cleaning and decontamination of the waterproof zipper. This suit also includes the same color/material overlay on the buttocks and knees. DUI offers an incredible range of options as well as made to order sizing. Due to the number of available of options (such as pockets, custom colors, sizing, etc. 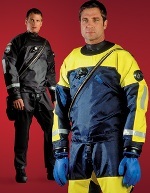 ), Scuba Center offers only "Select" version DUI TLS350 Public Safety suits online. "Made-to-order sizing" available only in-house at our Eagan, MN location (to offer you the bests possible fit and customer service). You can use the DUI Web site to learn more about DUI products and the exciting places they can take you. Then visit our Eagan, MN location for selecting the equipment, the features and the fit that is just right for YOU.